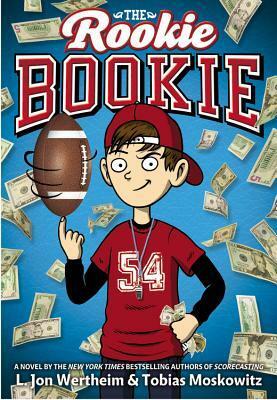 The Rookie Bookie by L. Jon Wertheim and Tobias Moskowitz is a nominee for the 2016-17 South Carolina Children’s Book Award. 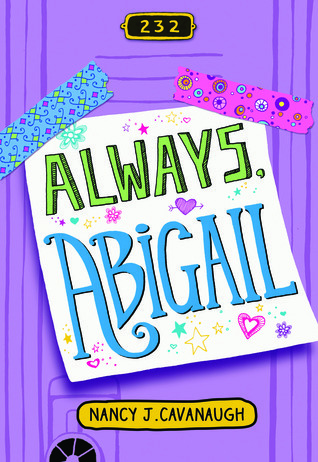 Always, Abigail by Nancy J. Cavanaugh is a nominee for the 2016-17 South Carolina Children’s Book Award. 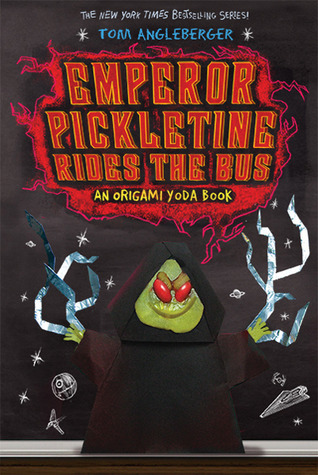 Emperor Pickletine Rides the Bus picks up where Princess Labelmaker to the Rescue ended, and the kids from McQuarrie Middle School are in for yet another adventure…one without Origami Yoda! Now that the FunTime Menace is no more, the students of McQuarrie Middle now get to enjoy things like elective classes and, of course, their highly anticipated field trip to Washington, DC. But what will they do when Rabbski, their principal-turned-math-teacher declares that origami–especially Origami Yoda–is off-limits? How will these seventh graders survive without the sage advice of Origami Yoda?! Have no fear! Dwight is here…with a bunch of Fruit Roll-Ups he folds into Fruitigami Yodas. Unfortunately, the vile Harvey also comes prepared with EMPEROR PICKLETINE, the most evil, sour, and smelly being in the galaxy! Harvey and Emperor Pickletine seem bent on ruining this field trip, and the Dark Side may be more powerful than anyone realized. Is Fruitigami Yoda strong enough to fight this new threat? As the seventh graders of McQuarrie Middle explore Washington, DC (and get into a fair amount of trouble), a battle is brewing between the Dark and Light Sides of the Force. Who will win? Will Yoda come through for the Origami Rebellion one more time? Well, I can’t say. But I can tell you that this final battle is full of mischief-making, fisticuffs, space food, and even a little bit of smooching! I’ll leave it to you to find out who does what! To learn more about all things Origami Yoda, click here. May the Force be with you! 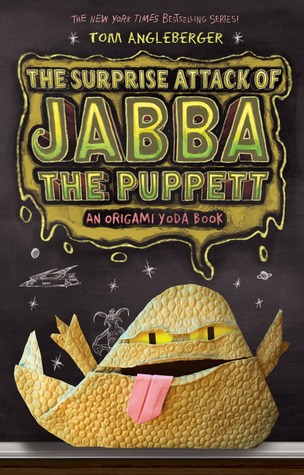 Note: Read the first four Origami Yoda books before reading this post! Will the Origami Rebellion finally get their principal to turn from the Dark Side? Who is the rogue rebel who gave the case file to Rabbski, and was that act worth it? Will the FunTime Menace finally be vanquished? 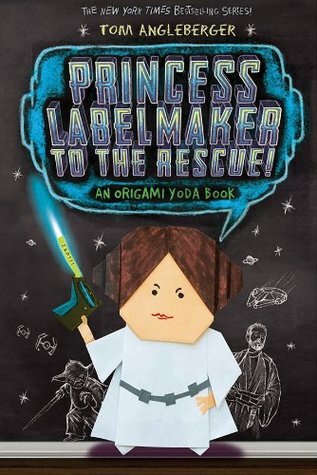 Find out when you read Princess Labelmaker to the Rescue! by Tom Angleberger. 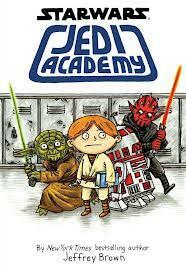 A few months ago, one of my 5th grade students brought a book to my attention: Jedi Academy. (How awesome is it that my students know how much I love Star Wars and look for ways to enjoy it with me!) I was totally charmed by this comic book/diary, and I think the same will be true of many Star Wars fans, no matter their ages. 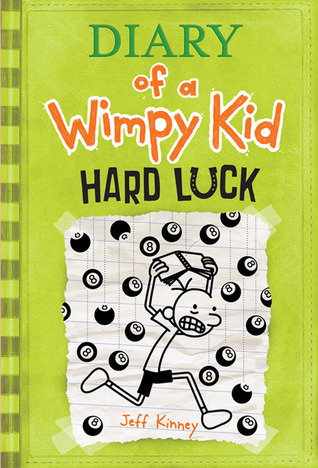 Jedi Academy is kind of like Diary of a Wimpy Kid set a long time ago in a galaxy far, far away, and I think it sends the message that middle school is hard on everyone…even aspiring Jedi! Roan has always dreamed of going to pilot school, but what’s a poor kid on Tatooine to do when he’s not accepted? Roan is sure he’s going to end up at farm school, but he receives a letter that will change everything. Roan has been accepted into the Jedi Academy! He’ll study at the Jedi Temple on Coruscant and learn all about the Force, lightsabers, and all that other cool Jedi stuff. Roan is very nervous about this new adventure. What if he’s not Jedi material? Most of the other kids have been training since they were toddlers. How can Roan hope to catch up? Well, he’ll have some help from his teachers, including Jedi Master Yoda (who is a young 700-year-old in this book), and some new friends. Will Roan have problems at the Jedi Academy? Sure! All middle schoolers do! Bullies, girls, learning new things, feeling unsure, exploding science fair projects, and finding a place to fit in. Roan goes through all of that, but he might just discover that he’s stronger than anyone (including Roan) ever realized. Is the Force strong in Roan? Read Jedi Academy to find out! In this fourth book in the Origami Yoda series, the students of McQuarrie Middle School are facing a terrible evil. More evil than the Empire. More evil than a Sith Lord without his morning coffee. More evil than Jar Jar Binks. (Well, maybe not that bad.) This semester, the school is eliminating all electives–Lego robotics, drama, music, yearbook–and forcing kids to spend those class times watching the horrible FunTime videos that are supposed to help increase standardized test scores. As one can probably imagine, the students are not happy about this, and, with the help of Captain Dwight and Origami Yoda, they decide to do something about it. The students of McQuarrie Middle form their own Rebel Alliance and try to figure out a way to put an end to FunTime (and it’s stupid singing calculator). Their plan is risky, but it may just work if they can get enough kids on board. Armed with a battalion of origami Star Wars figures, the students of McQuarrie Middle seek to restore order and balance to the Force at their school. Will the Rebel Alliance succeed in defeating the dreaded FunTime Menace, or is this war bigger than they realize? And what will this rebel band do when help comes from a surprising source? Learn just how much a determined group of kids can accomplish when you read The Surprise Attack of Jabba the Puppett by Tom Angleberger! May the Force be with you!